Matching faux leather belt features gold accents and a red "Z"
No one has seen his face....but everyone....knows this mark. In Mexico there is a man who fights for the rights of those who are unjustly punished. This man goes by the name Zorro and his weapon of choice is the sword. When ever he hears someone in distress he swings in, saves the day, and leaves a "Z" cut somewhere so people will know he was there. 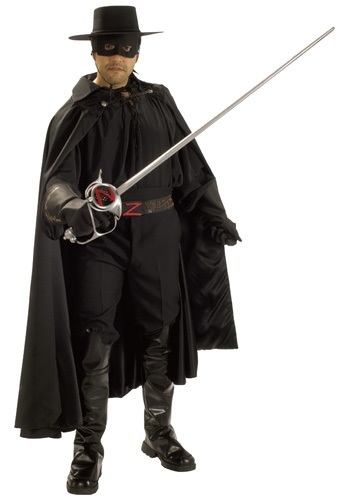 Now you can look just like the masked hero of Mexico when you wear this authentic Zorro costume.